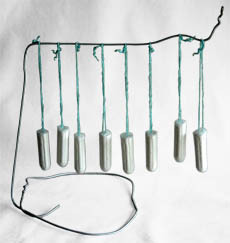 You’ve seen these rocket tampon ornaments in the finest galleries and homes. Perhaps you thought “I could never afford anything like that.” But now you can, thanks to Tacky Living’s rocket tampon tutorial! Best of all, this is a thrifty use for tampons which have lingered in one’s purse for so long that their wrapper has come off and they’re no longer sanitary.
. One or more OB or similar applicator-free tampons.
. An assortment of paint colors for the rocket, flames, and cockpit. 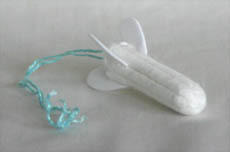 By their very nature, tampons absorb water-based substances very well and expand in the process. 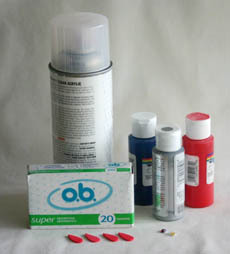 If you want a thick fuselage – more of a torpedo look – simply paint the tampons with water-based acrylic paint. However, if you want slim rockets, you’ll need to either spray paint them or, if using water-based acrylic paint, first seal them with spray-on clear coat. The elegant drying rack shown at left, formed from a coat hanger, is very useful for drying multiple tampons. To make the fins, we’ve glued four teardrop-shaped pieces of foam at equal distances around the “rocket”. Bits of cardboard or other substances would also work well. 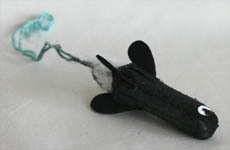 We used hot melt glue to get rapid results, carefully wedging the fins into depressions in the tampon for extra strength. Other types of glue would also be fine, although they’ll take longer to dry. Paint the entire surface of the tampon with your base color EXCEPT for the area on the end where the string comes out. Tease some of the unpainted cotton out of the string end of the tampon to make “flames”. A roughly conical shape looks good, but don’t worry if yours is uneven. In the cockpit area, paint a contrasting background roughly the size of a googly eye. After the background is dry, paint in the shape of a human or alien figure. In the flame area, paint the cotton you teased out. We like gradations of yellow, orange and red with the yellow closest to the spacecraft. Glue your cockpit cover on the front of the rocket, over the area you previously painted. We made the cockpit cover by cutting an “x” in the back of the googly eye, then pulling the plastic away with tweezers. This cut can be a little dangerous if you’re bracing the eye with your fingers, so work slowly and be careful! We used cyanoacrylate glue, aka “super glue”, to adhere the cockpit cover to the tampon. Add any other details you might want, like stripes or lettering. You’re done and ready to make your own science fiction “B” movie!
. Make enough rocket ornaments to decorate a Christmas Tree! If you enjoyed this project, you might also enjoy ..
101 Super Uses for Tampon Applicators. Although it doesn’t seem to be serious about the use of applicators as a craft item, it’s a light, diverting novelty book which may give you ideas for projects of your own. The book’s clever graphic design includes a cover which mimics a tampon box and a string bookmark reminiscent of the strings found on tampons. Inside illustrations are rendered as rough sketches which are nevertheless high on concept.